Today, we invite you to take a look from behind the printing press at the William Arthur Factory. While the elegant and unique holiday collection is available to shop, we would like to give you an insider's look at how the product is created in the factory. One of the top cards from the collection looks simple and classic but, with a closer look it becomes a complex work of art that only the skilled professionals at William Arthur can create. 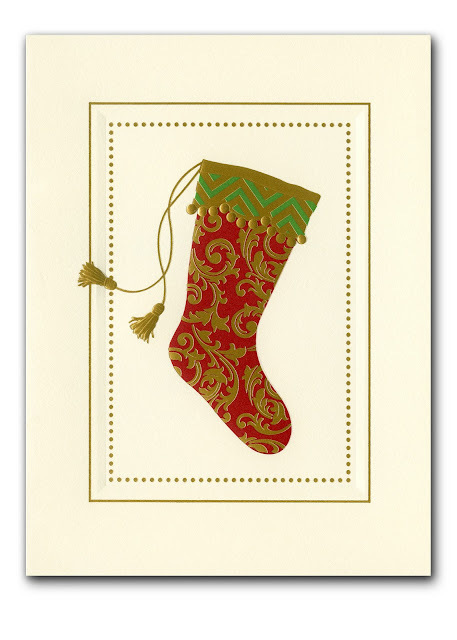 The Stocking Greeting Card features an engraved traditional Christmas stocking on the front flap. This beautifully colored artwork goes through an intense process to become engraved and to be featured on the front of your holiday greeting card. The first step in the process is to create a "reverse" photographic image on a film negative which is then placed on a chemically treated copper plate. This copper plate is called a die and is featured below. This die is now ready for die-stamping which, is the process of transferring ink to paper from an engraved die. The die is then placed on the press to create a "counter" image, cut to approximately the size of the area of the image. See an example of this below. Once this is competed, the ink is applied to the die. The ink is cleaned off the edges on the die but remains in the cavity of the image. Now, pressure is applied to the area where the image will ultimately be engraved. This forces part of the paper into the cavity of the die creating inked, raised surfaces in the paper. The final product is featured below and is sure to impress all your loved ones with its gorgeous artwork and your custom heartfelt greeting. While this is only one design from the Holiday Collection, all William Arthur greeting cards, invitations, and photo cards receive the same attention to detail and personalized attention. Instead of sending a plain greeting card this year, impress your loved ones with a detailed and unique product from William Arthur, available here.